Monkey bread is one of those gems that is sooo tasty it is guaranteed to be a huge hit at any family feast or special occasion. 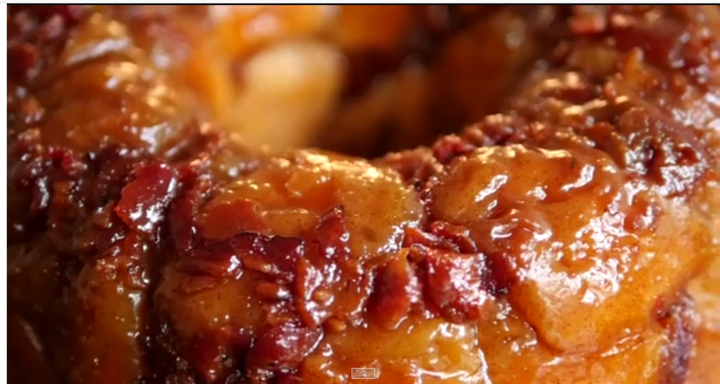 (Let’s be honest though – making monkey bread usually IS the special occasion….) For this unique version we added maple, caramel, and bacon – yep, that’s right, bacon – making this dish that much better for a morning brunch! Along with being absolutely delicious, with help from refrigerated biscuit dough, this is also an extremely easy recipe to make. Your family will think you toiled to create this epic masterpiece of sweet and savory goodness. We devoured all of ours within minutes of removing it from the oven, and we bet you will too!